We are very excited to have LeAnn Hillam and her groovy books back in the show after a brief hiatus of a year or so. Find old books with interesting covers still in tact-paperbacks or hard bound, or old sewing patterns etc. Take out the pages and replace them with blank paper, but leaving in a few old pages here and there. 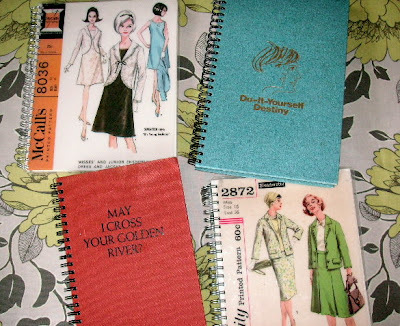 Here are a few from my private collection, I'm a little partial to the pattern books of course, but "May I Cross Your Golden River?" makes me smile every time I lay eyes on it.